DOWNTOWN LOS ANGELES. View looking down middle of street toward buildings of Los Angeles, traffic light foreground. Another view of L.A., some wires (from Metro Rail?) hanging in foreground. STAPLES CENTER LOS ANGELES. Est. shot Staples Center arena exterior, day. CONVENTION CENTER WEST TRAKT, LOS ANGELES. View through palm tree tops of Los Angeles Convention Center, day, blue sky. Talent is cleared, unless otherwise noted. Crowd shots are not cleared. Available in HD and 4x3 Digi Beta. LOS ANGELES DOWN TOWN. High WS Los Angeles skyline with shorter (residential?) buildings in foreground, early morning or late afternoon. Talent is cleared, unless otherwise noted. Crowd shots are not cleared. Available in HD and 4x3 Digi Beta. THE GROVE, LOS ANGELES. High angle shot, night, of The Grove shopping center (?) with lighted water fountain spurting up and pedestrians walking along, some shops in background. Head-on view through fountain of the complex, a sign in background says "Kill Bill." LAX SIGN AT THE LOS ANGELES AIRPORT Shot at dusk, sky is still a dusky blue. Letter L A X are lit. Higway in the background. 2 different angles, static shots. Talent is cleared, unless otherwise noted. Crowd shots are not clear Available in HD and 4x3 Digi Beta. TRAM TO LONG BEACH AT PICO STOP, LOS ANGELES. Metro Rail train heads slowly toward camera but the track turns so the train/tram doesn't hit the camera; downtown L.A. is in the background. Available in HD and 4x3 Digi Beta. THE ENCOUNTER RESTAURANT AT LAX - EARLY EVENING. Time lapse establishing shot of UFO-shaped restaurant exterior, lighted with colored lights; the lights of planes landing & taking off are seen in the background, as this is at Los Angeles International Airport. Unusual architecture. Talent is cleared, unless otherwise noted. Crowd shots are not clear Available in HD and 4x3 Digi Beta. DOWNTOWN LOS ANGELES. Several buildings in L.A. including US Bank Tower (formerly Library Tower), day, blue sky. TLS tops of two skyscrapers - US Bank Tower and a building next to it. Wide angle shot with more buildings in it. Other modern cityscape shots of downtown Los Angeles. DOWNTOWN LOS ANGELES. TLS part of Los Angeles skyline, office buildings, blue sky (no smog!). Compressed telephoto shot of the tops of two buildings; brown building in front has letters "TCW" (TCW Tower) and a white building is behind it (777 Tower?). Slightly shaky TLS of sign, "Hotel Figueroa," with building behind it. Talent is cleared, unless otherwise noted. Crowd shots are not cleared. Available in HD and 4x3 Digi Beta. LOS ANGELES DOWN TOWN. Time lapse. 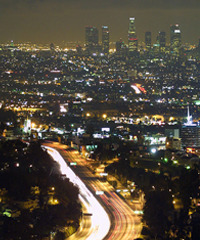 Very WS of Los Angeles area with skyline in distance, automobile lights moving by as cars drive along, evening or night. STAPLES CENTER LOS ANGELES. Est. shot Staples Center stadium from across street, light auto traffic passing, day. Tighter shot of part of the arena with name posted. Urban landscape - view looking toward buildings of L.A., Staples Center barely visible at left edge of frame. More views of the front of Staples Center. Talent is cleared, unless otherwise noted. Crowd shots are not clear Available in HD and 4x3 Digi Beta. TRAM TO LONG BEACH AT PICO STOP, LOS ANGELES. Nice view of downtown Los Angeles across tram tracks; the Metro Rail train travels on the tracks toward camera and passes camera. Available in HD (16x9) and Standard Definition (4x3) GV Hollywood sign on Mount Lee. LS Grauman's Chinese Theatre on Hollywood Boulevard, "Alien vs Predator" is the movie playing. LSs Hollywood sign in Los Angeles hills. Master 1486 - Tape 2 Aerial shots of Los Angeles, California, late afternoon / early evening, during sunset: residential, commercial, office buildings; baseball diamond; interstate freeway (highway) exchange; The Broadway on Hollywood. Aerial shots of Los Angeles, night, just after sunset (beautiful day into night sky): innumerable city lights; tall buildings such as The Wilshire, Crocker Bank, Union Bank, etc. TLSs entrance/exit no. 22 in spectator stands, zoom out & pan right to LS grandstand peristyle & spectator seats. The exquisite quality and lack of time-sensitive characteristics within the frame make this footage literally timeless, so don't let the date of origination fool you. Master 1784 - Tape 1 Exterior pan of abstract metal fountain on campus at the Los Angeles County Museum of Art. GV wall reading 'Los Angeles County Museum of Art'. LS pans of museum exterior. Stationary LSs of museum campus. Master 1818 - Tape 1 LS ranch style office building of Ramsey-Shilling Co. real estate. Low angle GV looking up at a sign on top of building reading 'Bingham Reality Co', a palm tree is also in the shot. MS sign reading 'Spencer Matthews Reality.' MS sign reading 'Henschel Meyer Real Estate.' MS real estate advertisement sign. TLS modest residential/suburban community in the Hollywood Hills area. LS ranch style brick home. LS raised ranch style home with manicured lawn and modest landscaping. LS new home under construction. TLS construction workers building a house. MS profile of shirtless worker hammering. MS profile of a young shirtless worker using a tape measure. LS suburban neighborhood with a car parked on the street. LS cute single level home with a 'For Sale' sign on the front lawn. MS realtor sign. MS sign on lawn reading 'Griffith Park Reality - For Sale- Sold.' MS sign posted on short wooden fence reading 'For Sale By Owner.' MS sign reading 'For Sale - M.L. Vaughan Reality Co.' Low angle MS looking up at sign for the 'Fuller Apts', advertising vacancy. CU sign at apartment complex advertising furnished and unfurnished apartments. MS sign on short lamp post reading 'Apartment For Rent.' MS billboard style advertisement promoting commercial real estate in a new mini-mall style shopping complex. MS sign reading 'Choice Stores Now Leasing on This Site.' Low angle MS looking up at sign reading 'Prestige Lots Offered at Public Auction.' GV bulletin board posting the auction bidder's information. CU detail posted on the bidder's info explaining terms and conditions. MS plot/lot map showing potential real estate. Aerial flyby over residential community in the Hollywood Hills. Aerial flyby over construction site, small landscape trees have recently been planted. Exterior CU "Capitol Records" sign, tilt to low angle MS looking up at the landmark Capitol Records tower building at Hollywood & Vine. Interior MCU sign reading "Quiet Recording Area" hanging above "A-Recording" studio. Nice GV pan inside the large recording studio, showing men seated in front of microphones. MCU sound engineer adjusting levels on control board as a second man looks on. CU Stan Freberg in dark rim glasses looking down while talking. MCU man talking. GV inside studio with men seated at microphones. MCU man hitting gong. MCU man operating recording equipment, the reel-to-reel machine. MCU man & woman inside the sound booth, man has hands on sound board, woman flips through paper script. Master 1899 - Tape 2 POVs driving through the heart of the Los Angeles Civic Center passing City Hall. Traveling shots past City Hall. 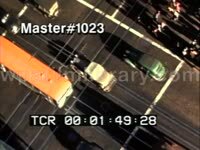 Master 1486 - Tape 1 LS First Federal Bank of Los Angeles corporate office building at Hollywood Boulevard and Highland Avenue in Hollywood, Los Angeles, California, automobile traffic -- including commuter bus -- passing in FG. Dim TLS parked airplane. Rear view TLS fuel truck driving along tarmac, Los Angeles International Airport (LAX), pan right to excellent LS large massive sun setting in horizon, smoggy hazy sky. Aerial flying over the sprawling city of Los Angeles. Elevated LS rafting competition in the ocean, spectators line the beach. GV Griffith park w/ sign in FG reading "Greek Theatre - Griffith Observatory". LS Griffith Observatory high on hill. High angle LS traffic moving along Wilshire Boulevard next to Macarthur Park, lagoon seen. Master 1785 - Tape 1 Nice aerial over Hollywood, California. Master 1779 - Tape 2 High angle LSs sparse, smoggy downtown Los Angeles skyline, traffic driving along snaking highways. TLS crowd gathered on Olivera Street in Los Angeles, California. Aerial shot of Los Angeles. TLS automobiles traveling along street marked by electric street car trolley tracks, passing theater during movie premiere, night. Aerial shot of Hollywood motion picture studio. LS Hollywood Bowl amphitheater lighting gradually, night. Traveling shot of Santa Anita Racetrack, cars in parking lot. TLS start of horserace, gates in BG. MSs newspaper production plant, printed editions rolling up and off the press, checker pulling copy from production line. Los Angeles Scenes Great elevated pan of Los Angeles, shot ends on Wilshire Boulevard next to Macarthur Park (West Lake Park). Traveling shot past mansion w/several palm trees in the landscape. MLS men on ladders picking fruit in orange grove. Slightly elevated GV inside factory w/rows of military airplanes in production. DESTINATION "HOLLYWOOD BLVD." MS streetcar with passengers boarding. MCU top of streetcar showing the destination "Hollywood Blvd. ", car begins to move. Nice MS of passengers getting on the "Hollywood Blvd." streetcar. Low angle GV man hanging board from roof of KNX building, apparently getting ready to clean CBS letters. Great LS CBS building, two palm trees & American flag flying from flagpole out front, heavy auto traffic in FG. GVs main entrance to the "Columbia Broadcasting System" building (CBS) with vehicular traffic moving in FG. Street level GV CBS building w/ traffic in FG. Low angle GV CBS building w/ flagpole & palm tree in FG. LS of CBS Television city w/ a few cars in parking lot in FG, the CBS "eye" logo on building facade. Establishing LS of CBS Television City with American flag flying from flagpole out front. Los Angeles, California: Excellent POV driving through traffic: palm trees, billboards & cars are seen. High angle GV looking down at pedestrians walking along urban sidewalk. GV man walking toward camera as the bustle of passing pedestrians goes on in the background, man buys a newspaper from newsstand. LS of car and silver city bus making a left hand turn at intersection, urban street is lined w/buildings. LS of an American Airlines commercial plane taxiing on a runway. Aerial of downtown Los Angeles. Aerial of massive highway system w/overpasses & exchanges. Aerial of residential neighborhoods. Master 1785 - Tape 1 CU neon sign reading 'Paul Verlengia'. CUs neon sign with a female face, marquee is advertising 'Earl Carroll'. MS pans of spotlight through trees. GV Hollywood street lit up at night. Blurry GV of people on the street. CU oscillating search light. Day POVs driving along street. CU marquee for the Ambassador Hotel Cocoanut Grove Nightclub featuring 'Lena Horne'. Day POV driving through Hollywood. TLS cars driving in front of city buildings in Los Angeles, California. TLS cars coming out of tunnel. Aerial flying over Port of Los Angeles. LSs docks with ships, cargo being lifted onboard. Hollywood Boulevard Night: Tilted MS neon marquee for the Hollywood Theatre & Ritz Club. Starts as CU of neon sign for the "4 Star Grill", then"4 Star Grill" neon superimposed over man playing nightclub piano. "7 Seas" neon superimposed over man playing nightclub piano, then "7 Seas" neon superimposed over showgirl feet tapping. CU neon marquee for the "Encore Restaurant". Los Angeles Scenes Footage of Los Angeles downtown and 5th street. TLS/high angle Los Angeles skyscrapers. TLSs 5th street. Los Angeles High angle LS city of Los Angeles with mountains in BG. Great high angle view of 1940s era vehicals moving along California highway. Static high angle LS tree-lined street in Los Angeles, California. Tilting high angle LS oddly cavernous business district in L.A. -- Desmond's, Brook's department stores, newsreel movie theater, street traffic including electric street car trolley. Nice high angle WLS Los Angeles, downtown area in screen left BG, mountains in far BG. Hollywood Boulevard Night: Slightly elevated LS Hollywood Boulevard showing colorful neon lighting the street, "7 Seas" seen in FG. TLS traffic moving along Hollywood Blvd. High angle LS Hollywood Blvd lit by neon & traffic lights. LOS ANGELES CITY HALL WS streetcar passing in front of Los Angeles City Hall. Los Angeles Elevated LS pan rooftops & buildings of LA. Low angle MS looking up at Los Angeles City Hall. Stationary GV residential stretch of Wilshire Boulevard showing palm tree lined median. Los Angeles TLS pan city of Los Angeles with red flowers in FG & urban skyline in the distance. TLS stately homes built into mountain landscape, bright red flowers are in bloom in FG. Elevated LS Los Angeles as seen from hill, urban landscape stretches into the distance, bright red flowers seen in FG. High angle LS city park surrounded by urban buildings. GV pan people enjoying lunch on outdoor restaurant patio on a sunny California day, traffic seen passing in BG. MCU sign hanging off building facade reading "Hollywood & Vine". MCU signs on cement pillar reading " Hollywood Blvd-Vine St". Beautiful GV intersection w/ pedestrians, bus & automobiles, large corner building across the street with Christmas tree holiday decoration hanging on facade. Los Angeles Traffic Nice slightly elevated head-on TLS of Los Angeles traffic showing 1940s era vehicles driving along urban street. Excellent CU/MCU old mechanical traffic signal that flips GO and STOP signs in unison with GREEN or RED lights, intersecting Hollywood Blvd. and Vine St. street signs seen on top of traffic light. Master 1779 - Tape 2 Excellent traveling shot (process plate, rear projection) along Sunset Boulevard in Hollywood, Los Angeles, California: shots starts, lingers outside Hollywood Press print shop at 8859 Sunset Blvd., then proceeds at great leisurely pace along the Sunset Strip, passing a liquor store, Shell Oil billboard, Shell gas station replete with service attendants in white uniforms, parallel-parked cars, Little Hungary restaurant, Hampton Shops gift shop and antique store, billboard promoting Durling column at L.A. Examiner, empty lots, steak house restaurant, bungalow office, The Westside Market, Mermaid Club, Cafe La Maze, Bellows and Company, Prince Rare Books, Doheny Smoke Shop, Flower Fair florist, Bit of Sweden restaurant, Karole's Salon of Beauty, KLA Publications, Maxime's, Contempo, Landi-Kennell Corp., etc. Hollywood Hills in the BG. Great archival footage of young Hollywood. View looking out the side and a bit toward the back from the traveling vehicle. See catalog #499738 for b/w version. Great TLS Theme Building & Encounter Restaurant (UFO shaped space age eatery) at Los Angeles International Airport (LAX), palm trees in FG. LSs Theme Building & Encounter Restaurant, empty parking lot in mid-ground, rustling palm trees in FG. LS Theme Building & Encounter Restaurant at LAX, numerous cars parked in parking lot in mid-ground, airport traffic in FG. LS air traffic control tower at LAX, parking lot at base, tropical palm-like tree swaying in breeze in FG. TLS airport departure terminal with buses parked out front, automobile traffic (including Volkswagen Beetle) passing in FG. TLS Flame of Freedom landmark display; an 'eternal flame" type monument w/ reflecting pool. LS air traffic control tower at LAX, congested automobile traffic passing in FG. LS Theme Building and Encounter Restaurant as viewed from drop-off departure terminal, white man wearing fedora hat & thigh-length coat pacing & waiting in FG while pedestrians & traffic pass by on either side of him. MS sign under cluster of power lines: "Los Angeles International Airport." 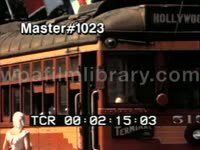 Same as catalog #523840 Master 1848 - Tape 1 Nice LS numerous multi-storey buildings dotting hills in basin valley in Los Angeles, California, Griffith Park Observatory atop Mount Hollywood in BG. High angle LS Griffith Park Observatory. TLS entrance to war memorial building, several American flags hanging from poles attached to building. Tilting high angle TLS tree-lined access road, palm trees-- note the electric street car trolley passing in FG.